Honey bees and beekeepers are at cross purposes when it comes to swarming. 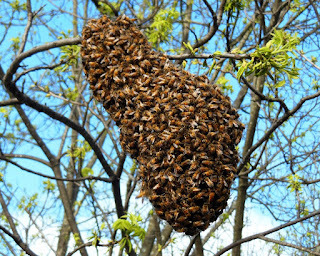 Bees readily swarm when conditions are right. For them, swarming is reproduction on a colony-wide basis. It means expanding their range, increasing their number of colonies, finding suitable new nesting sites, and eventually abandoning old nests and combs in decaying tree cavities. Swarming also breaks the brood cycle, helping to reduce the growth of Varroa mites in both old and new colonies. Beekeepers, on the other hand, usually try to reduce swarming, which often means the loss of a year’s honey production or pollination service. Honey bee colonies in the temperate zone typically expand their population in the spring and then divide their colony to form a second colony which flies away as a swarm. The act of swarming is risky for the bees; only a few swarms, maybe one in five, find a suitable permanent nest and survive for several years after leaving the parent colony’s nest cavity. Also, since the old colony must produce a new queen, there is the possibility that the requeening of the original hive may not succeed. If the old colony is not successful in requeening, it will rapidly die. 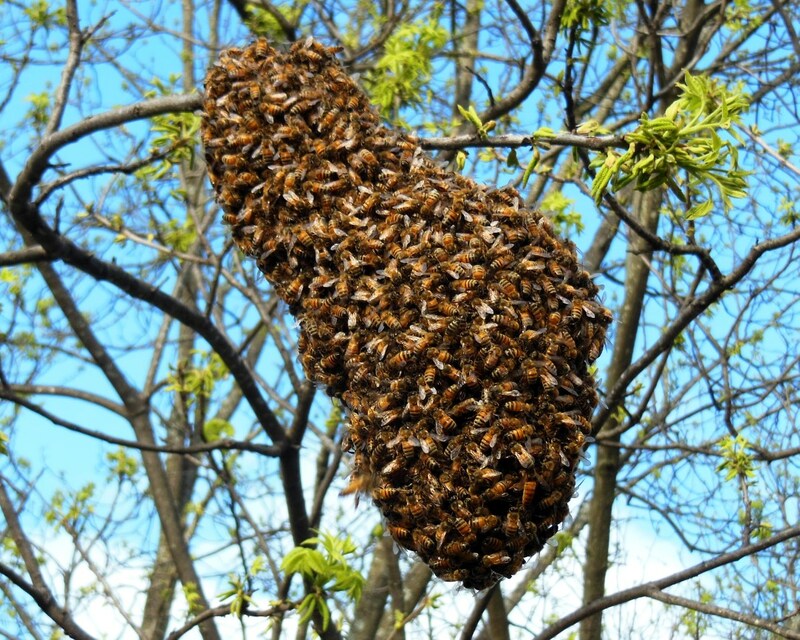 Collecting honey bee swarms is an exciting activity for many beekeepers. I assisted beekeeper Claranne Farris capture and hive a swarm that she encountered on an afternoon walk. The swarm hung on a pecan tree limb 10 feet in the air. Spraying a little sugar water on the swarm calmed the bees while I snipped the branch upon which they clung. After moving the swarm to a new hive, we noticed fanning by half a dozen workers, a good indication that the hive held the queen. Blocking the hive entrance with grass to slow the bees’ escape and adding one frame of open brood borrowed from another managed hive helps hold the swarm in place until they accept their new hive. Today’s photo: Claranne’s swarm resting on a pecan tree limb.